Edited by: William R. Leben, Firmin Ahoua. With a preface by: William R. Leben, Firmin Ahoua. With an introduction by: William R. Leben, Firmin Ahoua. Series edited by: Wilhelm J.G. Möhlig. 10 pp. Roman, 208 pp. The Kwa languages constitute a branch of the Niger-Congo language phylum and are distributed along the west African coast, from Côte d’Ivoire to Nigeria. Kwa languages are reknown for their isolating structure and complex tonology. The present volume contains texts in 13 of the 16 Kwa languages of Côte d’Ivoire: Abbey, Abouré, Adioukrou, Agni-Sanvi, Akye, Baoulé Kode, Baoulé Nanafwe, Baoulé Nzikpli, Éotilé, Krobou, Mbatto, and Nzema. Some of which are already endangered by extinction (notably Eotilé and Ega). The 25 texts are provided with a detailed phonetic transcription, an interlinear morphemic translation and an interlinear translation into French, and a free translation of the story’s content following each text. Apart from fairy tales and fables the authors collected descriptions of activities (e.g. agriculture and preparation of food) and customs, as well as orally transmitted stories of historical events. The textual material in this book has the primary aim to document the different Kwa languages, which will offer valuable material to anthropologists and linguists for further research. 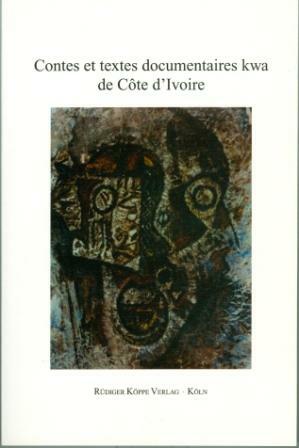 Additionally, it serves as a basis for the phonological analysis published as Morphophonologie des langues kwa de Côte d’Ivoire by the same authors, in this respect supplementing the Atlas des Langues Kwa de Côte d’Ivoire by Georges Hérault (1982).